Historically the care of the indigent and the poor had been the domain of the Church in medieval Europe. In early US history, Almshouses were erected in order to provide a place for the poor. Varying laws were passed in each state that established “Overseers of the Poor” for each township. In the 1700’s and 1800’s, the almshouse sheltered the insane, physically handicapped, as well as indigent adults and children. The position of ‘Overseer’ was generally an unpaid one, and there was no regulation for the treatment or care of the ‘inmates’. In 1824 a law was passed in New York officially establishing and requiring funding for Poorhouses. Each county was to purchase and designate land suitable to build a poorhouse. Local and county taxes were enacted to cover this cost as well as provide funding for upkeep of the Poorhouses. 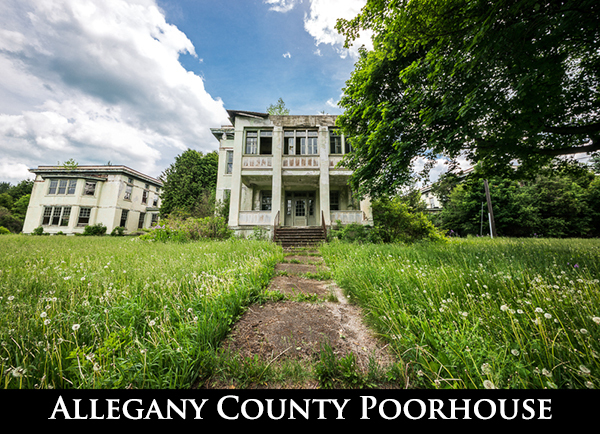 In response to this law, the Allegany County Poorhouse was built in the 1831. 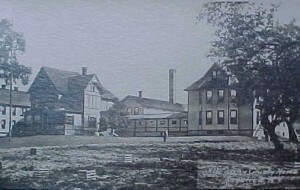 Like most other poorhouses it contained a working farm on which the inmates who were able-bodied were required to work. The farm provided for the inmates and was also a source of income for the poorhouse. 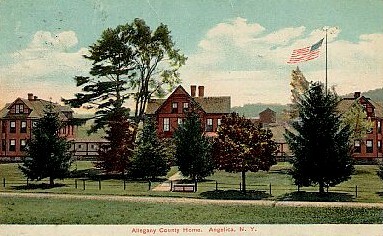 An 1857 report reads: “This house is located two miles from Angelica. It is of good size, two stories in height, and built mainly of stone; connected with it is a farm of 180 acres…There are seventeen rooms or wards warmed by stoves, but without ventilation. The number of inmates is seventy, the sexes being about equally divided. The sexes are separated at night. They are under two keepers, both male. The average number of inmates is fifty-seven, supported at a weekly cost of $1.03, exclusive of the products of the farm. The paupers are employed on the farm and about the house. The supervisors have once during the past year visited the house. There is no religious instruction furnished, nor is the house supplied with bibles… A physician is employed at a salary of $80, who visits the house once each week, and oftener when called. No provision is made for bathing. During the year there have been five births and eight deaths. Of the inmates four are lunatics, two males and two females; all are paupers. One, a female, is constantly confined in a cell. The insane are generally confined in this way, sometimes by the ball and chain. None within the last year are reported improved or cured. They have not attendance of any kind. Their cells are of the most filthy and loathsome description. They sleep only on straw, and make their evacuation in their rooms, which are seldom if ever cleaned. They are treated barbarously. The lunatics frequently escape; one last spring, of whom no trace was found, and it was represent that he starved in the woods. Seven of the inmates are idiots; four males and three females. Intemperance brings here two-thirds of the paupers. There is at this time no regular keeper in charge of the house, but only an ordinary hired man attending on both women and men. The superintendent of the poor chanced to be at the house during the visit of the committee, and being asked if corporal punishment was administered to the paupers, replied that the keeper sometimes gave the unruly ones a “tanning;” and being asked what that signified, said “he took them by the collar and flogged them with a rawhide.” The house is poorly kept. 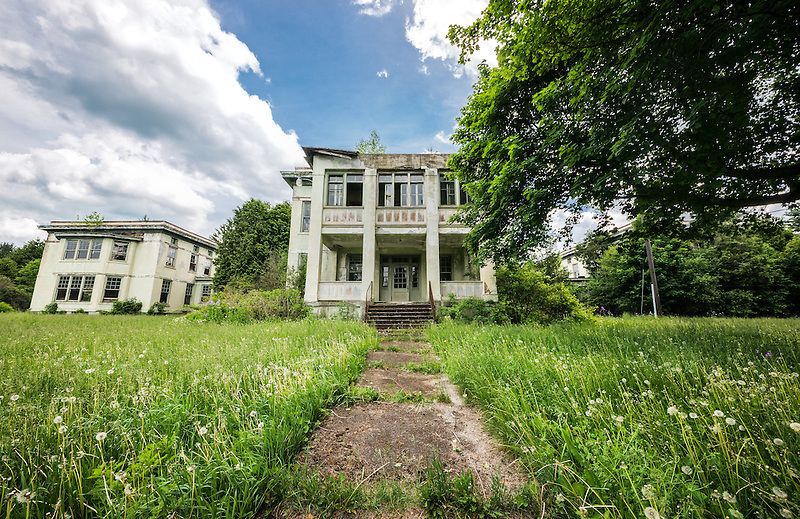 In the late 1800’s some efforts began in order to document the insane in these poorhouses in order to remove them and bring to asylums in Binghamton and Willard in NY. 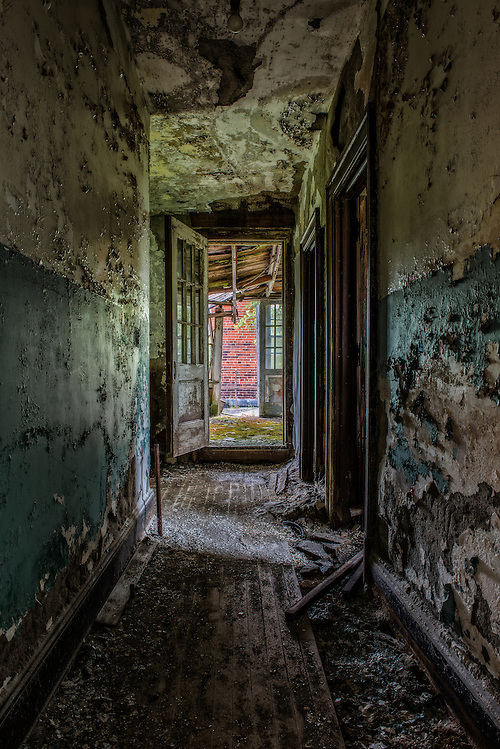 In 1883 there were over 500 documented insane residing in various county poorhouses across NY State. In 1923 the Allegany County Alms House burn to the ground in what was described as the “most horrible event in the history of Allegany County”. Eight people were killed in the fire, and the entire house and everyone’s belongings were burned to the ground. 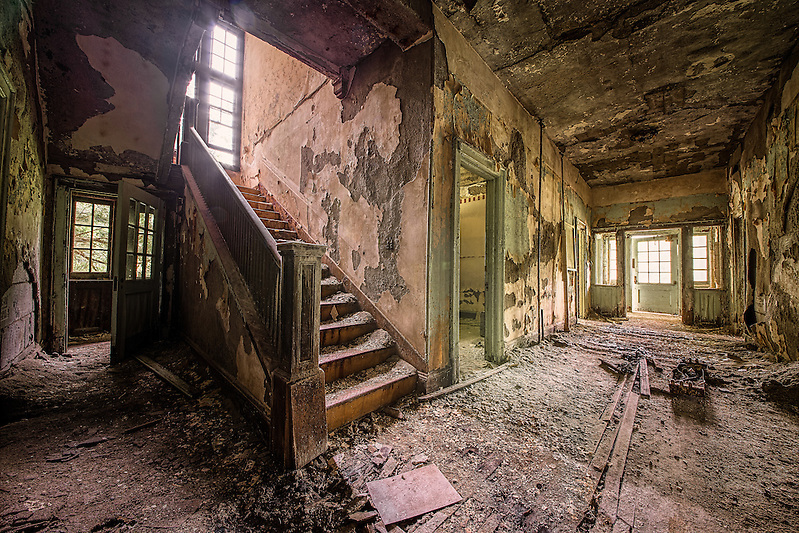 In 1924 the poorhouse was rebuilt as a ‘fireproof’ structure. 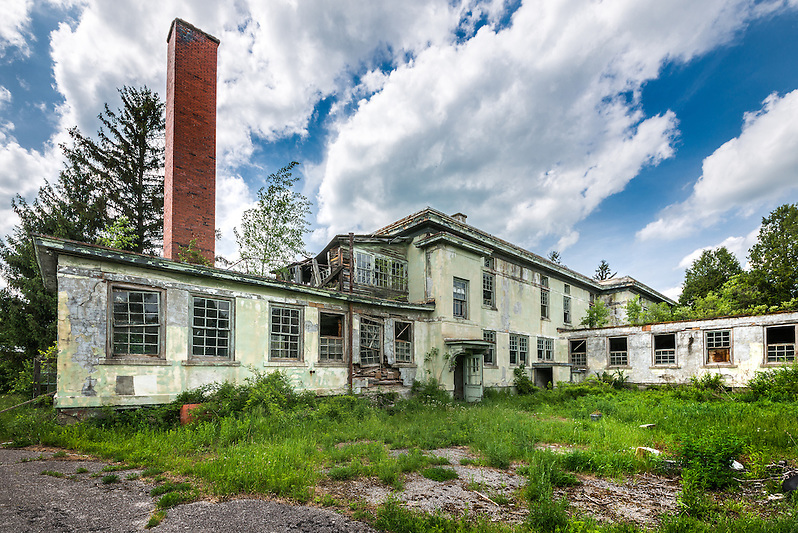 This was the building that we explored on our 2013 visit to Upstate NY. 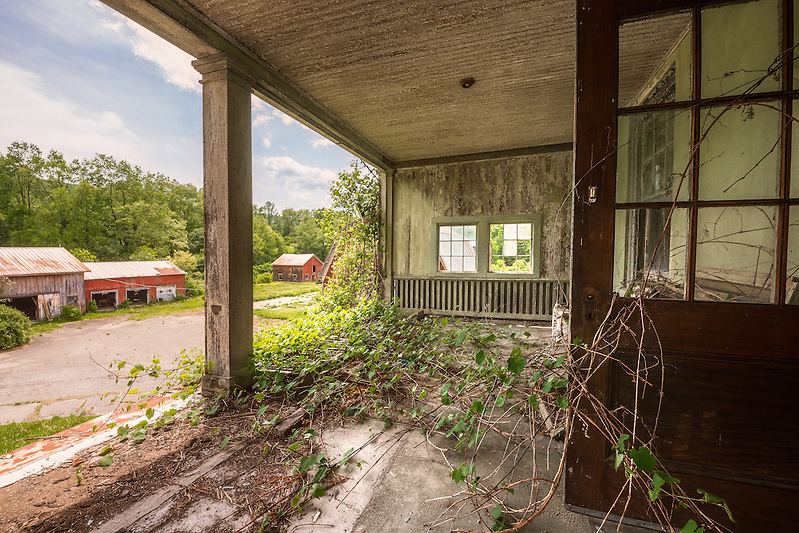 A friend of a friend had told us that the property was owned by an elderly lady, and she was extremely nice and would let us photograph the location if we spoke with her prior to exploring the poorhouse which was adjacent to her residence. When we arrived and knocked on her door we received no response. We waited around, knocking several more times, but no one answered. We opted to post a handwritten note on our car which was parked in plain sight, stating that we were there to photograph the location and provided our cell numbers in case anyone arrived while we were inside the building. 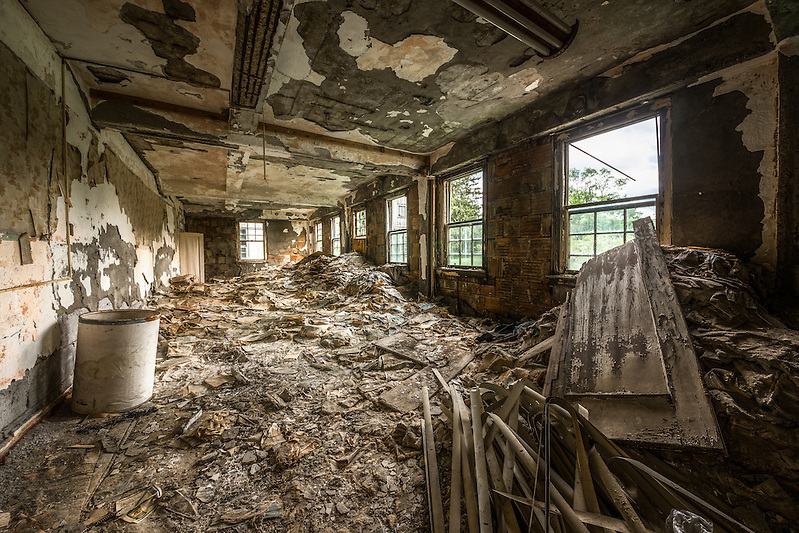 The building was in rough shape from our exterior inspection, but as we entered it was clear that this place had been exposed to the elements for quite some time. 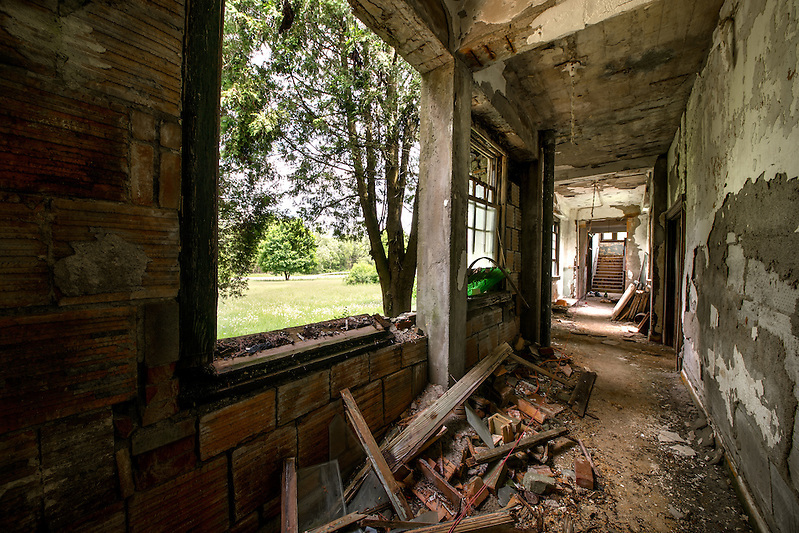 With many doors and windows missing, the breezy summer afternoon air flowed freely through the building. 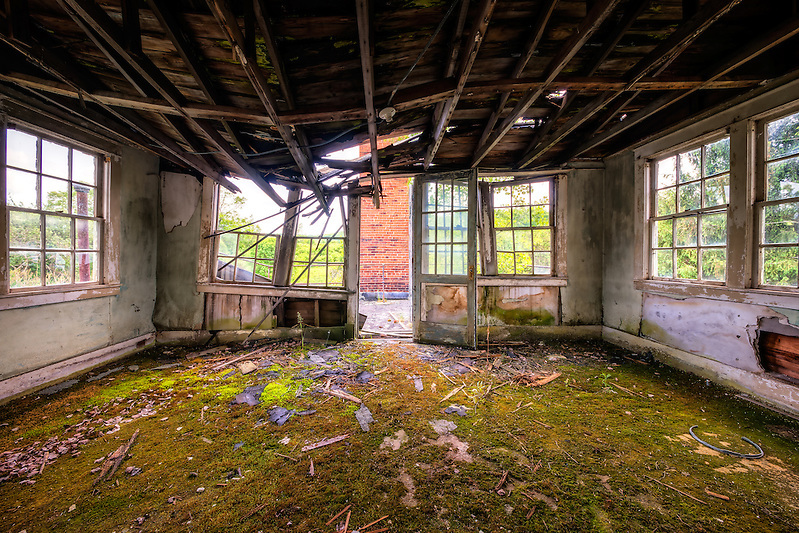 As we walked around we heard a door slam above us on the second floor. We called out thinking someone was inside and waited… No answer. 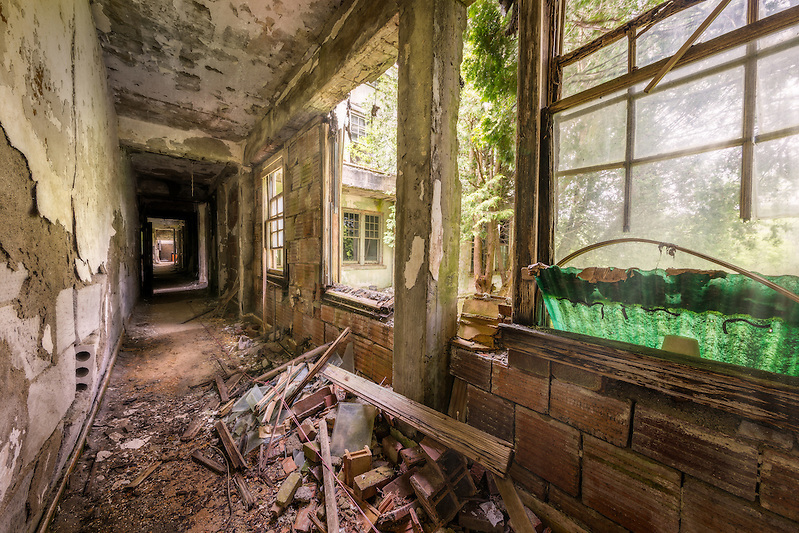 Treading softly through the dust and decay of the ground floor we made our way to the second floor. A quick inspection revealed that the cross breezes through the semi open structure were prone to opening and closing the broken swinging doors throughout the building. This discovery calmed us down a bit, but it was still quite unnerving when the occasional *SLAM* would echo through the quiet building when we least expected it. 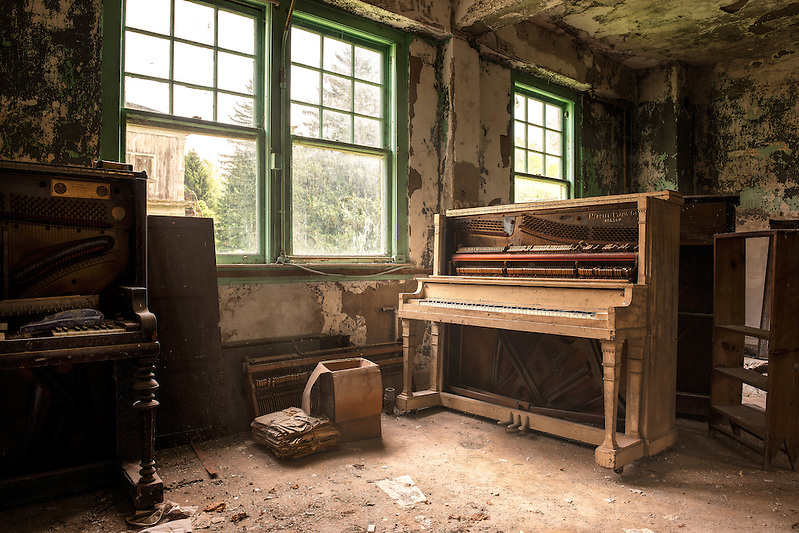 Wandering into the center of the building revealed a large room with several old pianos sitting around. 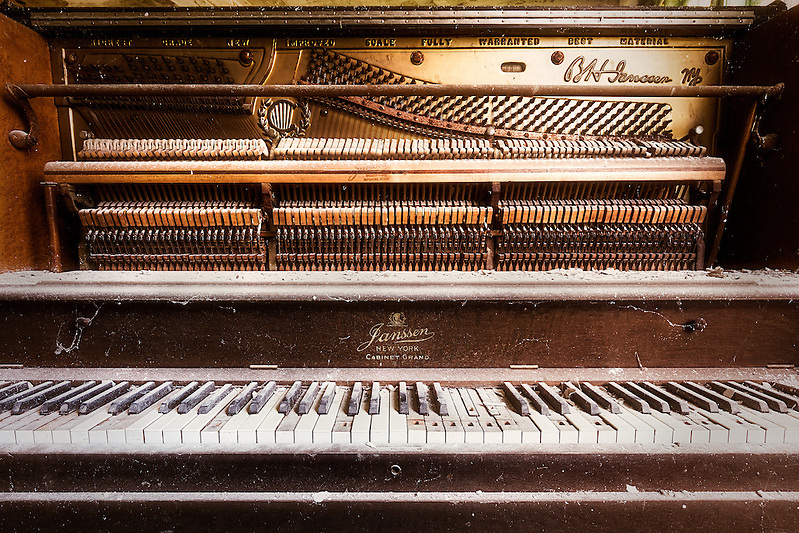 I had been looking for a scene with a broken decaying piano for some time, and was elated to find these beautifully broken and decaying instruments! 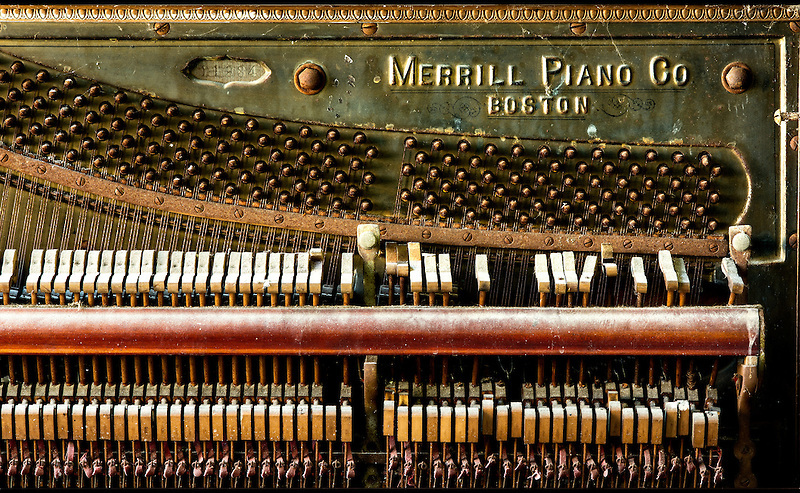 Being a pianist myself, I thoroughly enjoyed photographing the broken hammers and strings and misaligned dust covered keys. While shooting them, I began to film some video footage of the hammers hitting the strings for the video I was intending to make. 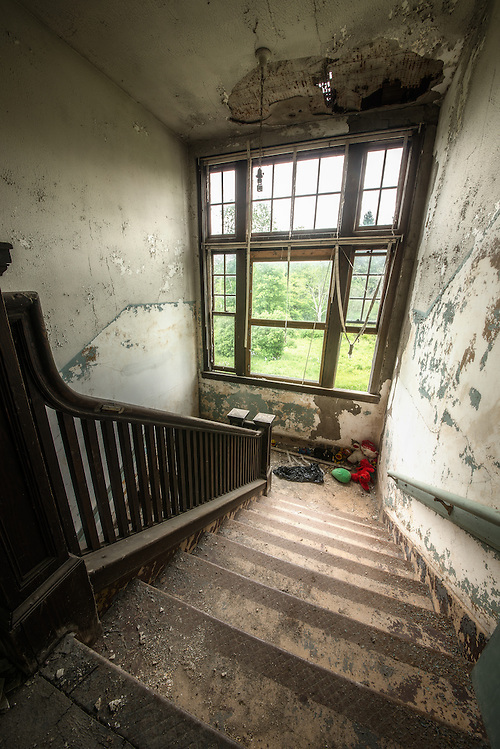 My friend and fellow photographer who was with me (A.D. Wheeler) was upstairs and had no idea where I was or what I was doing. I sat down and filmed some footage of me playing the piano and then left the area to shoot another part of the building. A.D. who was peacefully shooting upstairs, heard a cacophony of piano notes being played below him. 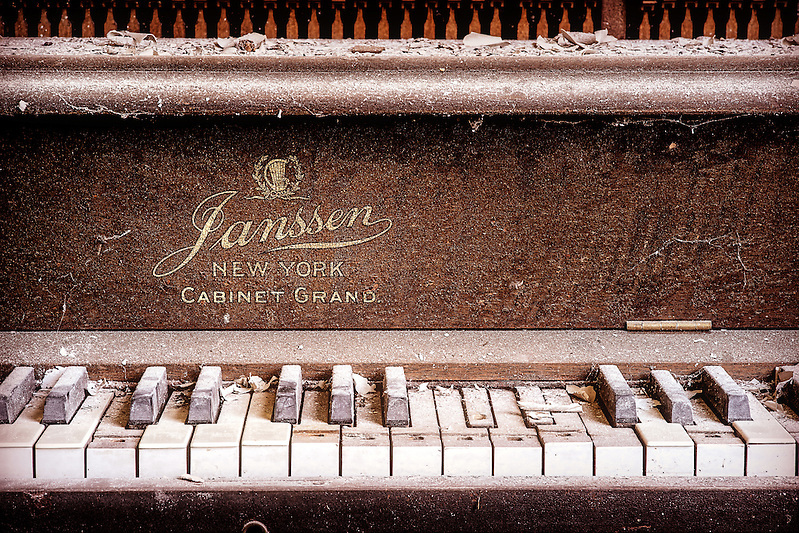 He packed up his gear and came downstairs only to find an empty room of old pianos. Completely rattled, he scouted around until he found me frantically asking if I heard the strange music. Laughing hysterically I informed him that I was the one tinkling the ivories and a wave of relief washed over him. 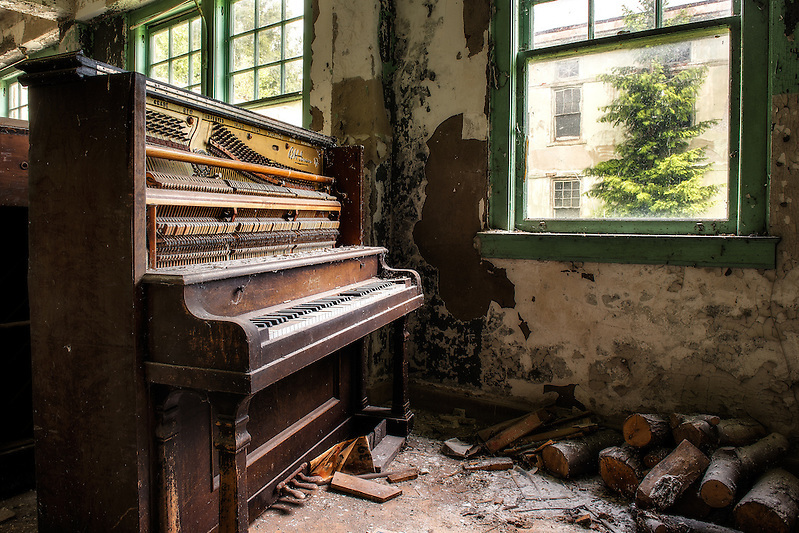 Slamming doors can be explained by the wind, but piano notes mysteriously echoing through an abandoned building are another thing, especially when you are on edge already! 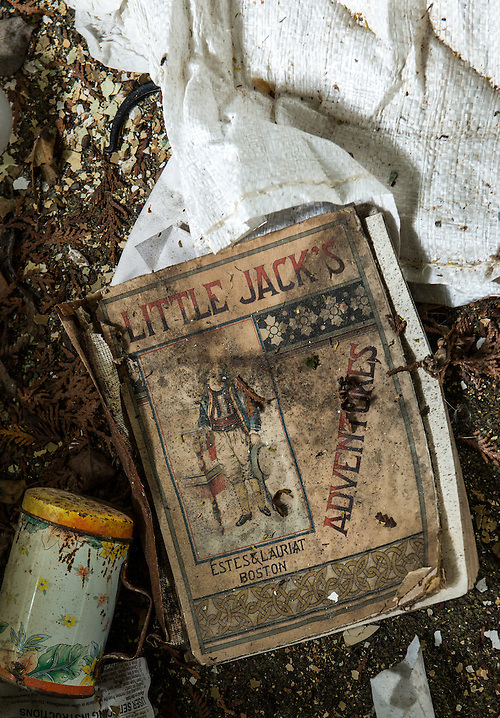 One large room was packed full of overflowing mounds of old newspapers. The stacks consumed the entire room and some were almost six feet high! All in all we spent two days photographing and producing video at the poorhouse. It was a very interesting location and had an intriguing history. Absolutely beautifully done. 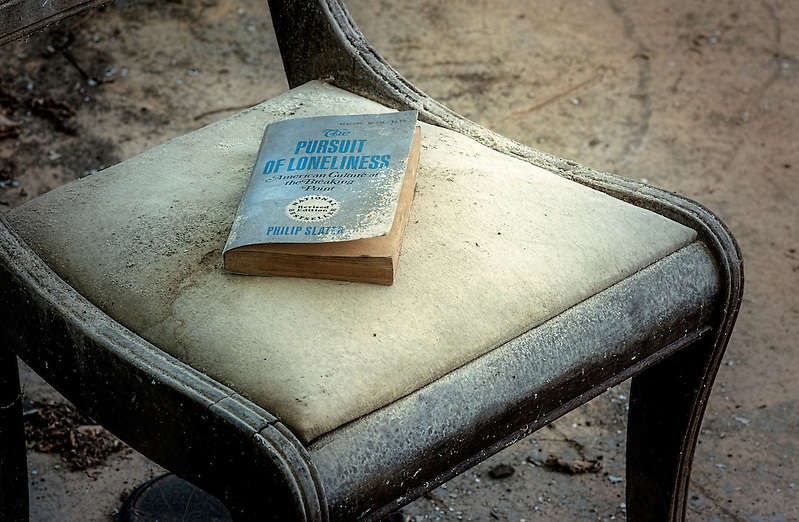 This whole piece give honor and respect to those forgotten and abandoned lives. Your work on this project may inspire viewers to remember. I am wondering who did the vocals on this video. Thank you @Diane! So glad you enjoyed this piece! The music in the video was the Cinematic Orchestra, To Build a Home.